Turn Friday Night into Shabbat! 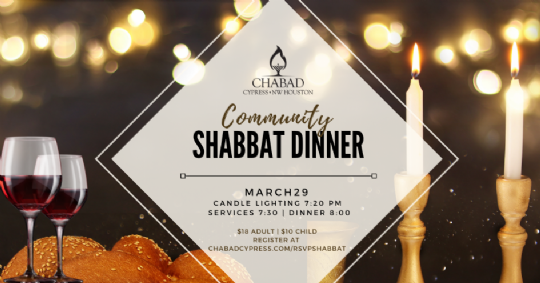 Join us for our monthly Community-Wide Friday Night Shabbat Dinners. Enjoy a four-course, home cooked dinner in a warm, candle-lit, community atmosphere. Bring your friends and taste the greatest treasure known to the Jewish people — Shabbat! Candle Lighting @ 7:20pm followed by services at 7:30 & dinner @ 8. Looking Forward to an uplifting Shabbat together! !